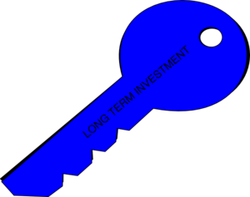 Long term investment incorporates time into the equation for the key to future wealth. A long-term investment strategy beats short-term trading strategies every time. To illustrate the difference between the two basic investing approaches (long term investment vs short term investment) we can call on one of Aesop's Fables: the tortoise and the hare. You will recall the hare rushed to get to the finish post first, but was distracted along the way. The tortoise progressed slowly and steadily, taking small but steady steps, and reached the finish line before the hare. Long term investment is akin to the strategy the tortoise undertook. Short term investment is like the strategy the hare went with. Taking incremental steps to future wealth, brings time into the equation. As we know, time can have dramatic effects. Just look at geology. Yoou should look at investing in the same way that the tortoise approached the race. Taking small but steady profits will allow you to reach your investment goals, whereas rushing into speculative purchases, trying to get rich quick, will inevitably see you coming up short of a satisfactory outcome. Security and prosperity comes through cultivating the tortoise approach. Taking higher risks and searching for that elusive big pay day to make you rich - the hare's way - will be just that, elusive. Tortoise beats the hare every time! Or to put it in investing terms: conservative long-term investing strategies invariably beat speculative short-term trading strategies. Research has shown that portfolios less volatile than the stock market index outperform, by a significant amount, those that implement a more speculative strategy. When you allow stockbrokers to invest your money, it is likely that, in order to keep your business, they will try to show you a quick return on the investment capital you have left with them. They fall into the same mentality as did the hare. They try to find an investment that will show an overnight profit. The same response is highlighted in their investment newsletters, and even more so with independent tip sheets - quick bucks: short-term investment in an equity that looks to be ripe for the picking, and about to show a spectacular rise. Use investment newsletters and tip-sheets at your peril. Research has shown that following those that play the speculative game is much less likely to make you an overall profit than taking a more pragmatic approach. Do not get me wrong - there is a place for investment newsletters and tip-sheets, but you must learn to read them with an investors eye. Evaluate and analyse the prospective investments yourself. And my advice would be to buy into those equities that have a recommendation of hold. Because the investment strategist obviously reckons that to divest from these would not be wise. A long-term hold is pretty likely to show you a profit-margin you can bank. Day-traders may get a benefit from the hordes taking the tip-sheet advice to buy (as will the tipster too, no doubt), but as fast as the equity goes up, then it is likely to bounce back down again, just as quick. And most likely fall below the price that you paid, unless you are very quick. And, do you think that the market-makers don't read the investment tip-sheets and newsletters too. And adjust the prices accordingly, before you even get a sniff of a purchase? Well I've got news for you! Taking modest gains and compounding them over time is the sensible profitable strategy of the investor. Take the approach of the tortoise - slow and steady progress inevitably gets you to the finish line. Only go for the big hit if your own analysis tells you that it is a sound investment, and only take it on with money you can afford to lose. Don't count on speculative investments to make you rich. They are more likely to keep you poor! If stockbrokers can't hit the jackpot every time, then why should you think you can? The real road to wealth is that which is trod steadily. Diversification of a portfolio of investments brings lower risk, without diluting potential return on investment. But over-diversification is as harmful as under-diversification. The key to future wealth is long-term investment!